Do Therapy Dogs Help Alzheimer’s Dementia Patients? Visit any critical care unit, children’s hospital, or other specialty inpatient facility, and you’ll find a common feature: therapy dogs. For decades, healthcare practitioners have understood the surprisingly positive effects on patients of time spend with cute and cuddly dogs. Therapy dogs reduce stress, improve mood, and can help patients reframe their outlook on whatever condition ails them. The positive effects of patient interactions with therapy dogs are a well-documented fact of the medical world. Senior citizens with limited mobility and other health conditions also benefit from the companionship of dogs. Owning a pet reduces feelings of loneliness among seniors living at home or in a retirement facility, which in turn greatly reduces the risk of diseases associated with loneliness and isolation. Pets can also decrease the number of stress hormones in a person’s blood, lower blood pressure, and contribute to a more positive outlook on life. Dogs and other pets, it seems, have tremendous healing powers! Since Alzheimer’s patients cannot adequately care for a pet, owning one is out of the question. Considering the nature of Alzheimer’s dementia, it is easy to assume that a loved one may not benefit from a pet since they will not remember the interaction. Researchers, convinced therapy dogs would have a positive effect on Alzheimer’s patients, put this question to the test: Do Therapy Dogs Help Alzheimer’s Dementia Patients? Short-Term Benefits of Therapy Dogs for Patients with Alzheimer’s Dementia. A study conducted in the early 2000’s looked carefully at the subject of therapy dogs and Alzheimer’s dementia patients. They measured the incidence of behavioral disturbances among patients in a nursing home for a period of four weeks, then introduced therapy dogs. Their initial findings showed that the dogs helped to reduce behavioral disturbances in the short term, meaning they helped to immediately calm patients. The short-term effects proved that therapy dogs do have a positive effect on patients with Alzheimer’s disease, particularly in regards to anxiety, anger, and changes in behavior associated with the disease. Long-Term Benefits of Therapy Dogs for Patients with Alzheimer’s Dementia. The same study did not stop at the short-term effects of therapy dogs on Alzheimer’s patients. Previous assumptions suggested that since patients would not remember their encounters with the therapy dogs, the effects of spending time with them would vanish from one day to the next. Not true, the study authors found. Although most of the patients did not remember their interactions with the therapy dogs (some did), the behavioral disturbances noted in the four weeks prior to the study reduced. In fact, the longer and more frequently patients interacted with the therapy dogs, the less they exhibited behavioral disturbances. Therapy Dogs As A Long-Term Therapy. 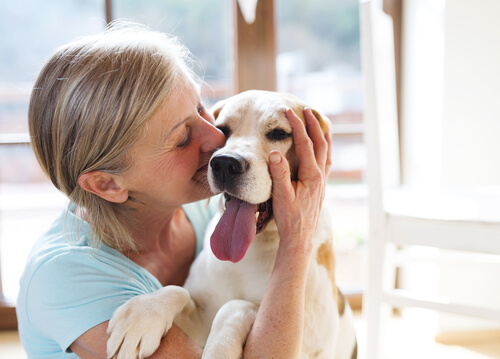 The study findings confirmed what clinicians suspected all along: dogs are an excellent long-term therapy for persons with Alzheimer’s dementia to reduce the incidence of behavioral disturbances. Therapy dogs also had the same effect on Alzheimer’s patients as they do on other kinds of patients, including reduced stress and anxiety, lower blood pressure, better appetite, and fewer feelings of loneliness. These effects continued to increase the longer and more frequently patients interacted with the dogs. What Makes Dogs Such Good Therapy? Dogs are wired to give unconditional love and devotion. They can provide physical and social contact where it is missing, and they are not picky. what sets dogs apart, particularly those trained as therapy dogs, is that they will approach anyone regardless of their physical or mental deterioration, and initiate contact. Patients can pet, hug, and cuddle dogs unlike any other kind of pet. These positive interactions provide a distraction to the other goings-on around them and provide relief for those suffering from sadness, anger, or angst. Dogs have a tremendous healing power. While studies have focused specifically on Alzheimer’s dementia patients, their positive effects will benefit anyone suffering from general dementia. Families of patients will feel relief that their loved ones have fewer outbursts of anger, sadness, or angst. While dementia impairs memory, it does not interrupt the long-term benefits of regularly interacting with a therapy dog. In fact, the more they interact with a therapy dog, the fewer behavioral problems they exhibit.